Loosetooth.com Lab - January 2-4, 2019 - 3 spots OPEN! 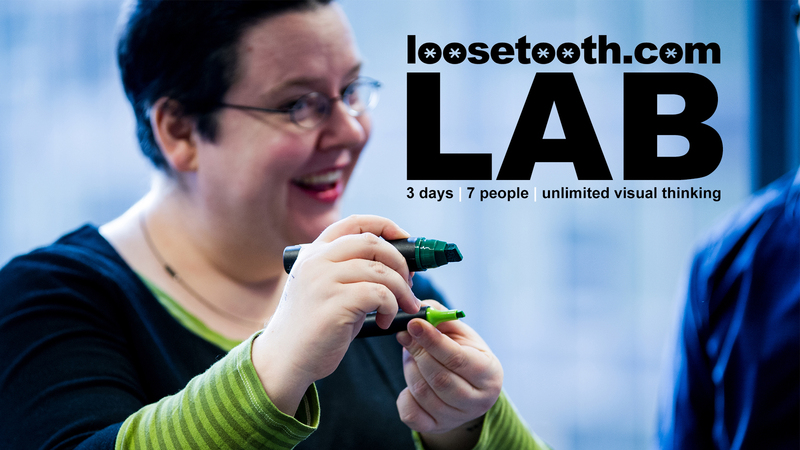 Loosetooth.com Lab is Brandy Agerbeck's signature workshop experience. An in-depth retreat into the world of visual thinking through the lens of graphic facilitation. In this challenging, yet safe environment, we immerse ourselves in mapping concepts and conversations live and large. You and 5 other "lab partners" will be led in three days of inquiry, exploration and growth of your visual practice. Every Lab starts with the same exploratory exercise on our first morning together - then the agenda emerges from the needs of the people in the room. Since starting The Lab in 2012, Brandy has lent her 22 years of professional experience as a graphic facilitator and 40+ years of personal drawing experience to set up exciting, hands-on experiments, facilitate deep discussion, and to guide your work giving direct and constructive feedback.